Home / Published Works / Articles / How to save your marriage! If your marriage or love relationship is worth saving – and many are! – then these steps may help. They will take you towards a renewed awareness of how you can lift your partner’s spirits – and your own – with consistent, trustworthy attitudes and acts of kindness, consideration and thoughtfulness. These are the most precious jewels you could ever give. They create an atmosphere of trust and affection where everyone can flourish. Such behavior makes you easy to love; it makes you delightful to be around. No investment we make will ever be more important than the time and thought we put into our closest relationships. 1 Offer at least as much consideration, courtesy and interest as you would to your most valued friend. 2 Remember how wonderful it was when you met? When this fine person looked your way and kept looking? See your partner as a separate person, complex and never entirely known. Take nothing for granted. 3 Enjoy one another’s company. Sustain a life beyond shared and separate tasks. 4 Difference, even conflict is not itself a “problem”. Problems come when you can’t resolve conflict thoughtfully. Your own interests are best served when you recognize that each of you depends for your happiness on the kindness and thoughtfulness of one another. 6 Silence your complaints. (They are never worth it. They never get you what you want.) Speak up constantly about what’s positive. Have more of that. 8 If you have children know that they will learn respect and love from the way you treat one another. Be the example your children deserve. 9 No woman finds a man sexually attractive if he demeans her, trivializes her, blames her for his misery, tries to control her time, money, friends or thinking, or “can’t” share housework and childcare. 12 Your bad moods or ancient miseries do not justify criticism, stonewalling, sarcasm or verbal abuse. Those behaviors are toxic for you and your partner, and fatal for your relationship. Move on. 13 Notice the content of your nastiest accusations. They will describe you far more accurately than they will your partner. Take action. 14 Check what you believe are your intimacy “entitlements”. 15 Know that your partner is not your parent. 17 Even if you don’t believe in God, thank God every day for your continuing relationship. Regard it as your most precious achievement. Act accordingly. 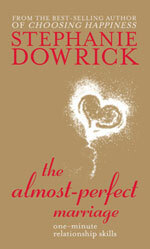 Dr Stephanie Dowrick is the author, among other books, of The Almost-Perfect Marriage and Intimacy and Solitude.